Stop light visibility was never a strong point for the classic Beetle. Now, Beetle owners can upgrade their stop, turn, and taillights to the latest in LED lighting technology. The all new Technostalgia LED retro-fit kit snaps into a stock 1956-61 VW Beetle taillight housing and converts all rear lighting functions to bright and visible LED lights. The installation takes about 30 minutes and requires no electrical knowledge. At the heart of the new kit is the Technostalgia manufactured LED array that incorporates fourteen, automotive grade LEDs. This guarantees ultra bright performance, a wide dispersion angle, and maximum visibility of the tail light, stop light, and turn signals. The LED array is expected to last for the life of the vehicle and draws very little electrical current. The kit is backed by Technostalgia’s lifetime warranty. These are compatible only with 12 volt, negative ground cars. Of course, the classic “snowflake” design was maintained in the all new acrylic lens. 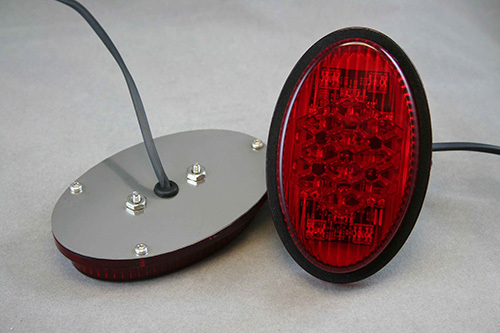 The lens is manufactured from new tooling and is designed to enhance the LED light. Stock appearance is maintained when the lights are off. The LED retro-fit kit ships assembled and ready to install. The kit includes the LED array, a molded acrylic lens, lens-to-taillight housing gasket, 24 inch wiring pigtail, stainless base and hardware, and installation instructions. 12 volt, negative ground only.